I need your help on this one, forex buddies! I’ve got a strong bullish bias on the U.S. dollar and I’m bearish on the Loonie, but I can’t decide where to go long USD/CAD. Won’t you help me out? The December Fed liftoff is the talk of the town these days, especially since the October U.S. NFP came in much better than expected and FOMC officials have been casually dropping hints about a rate hike in their testimonies. In contrast, jobs data from Canada has shown a lot of weak spots in the underlying data, suggesting that the BOC ain’t likely to shift from its downbeat stance anytime soon. Besides, risk sentiment ain’t doing the Loonie any favors these days since expectations of Fed tightening could dampen trade activity and inflationary pressures, weighing on the commodity-dependent and higher-yielding Canadian dollar. Since a bullish flag pattern formed after the recent strong surge, I’m thinking that buyers are just taking a quick break before heading much further north. Stochastic is already moving out of the oversold region, hinting that another sharp climb might take place soon. 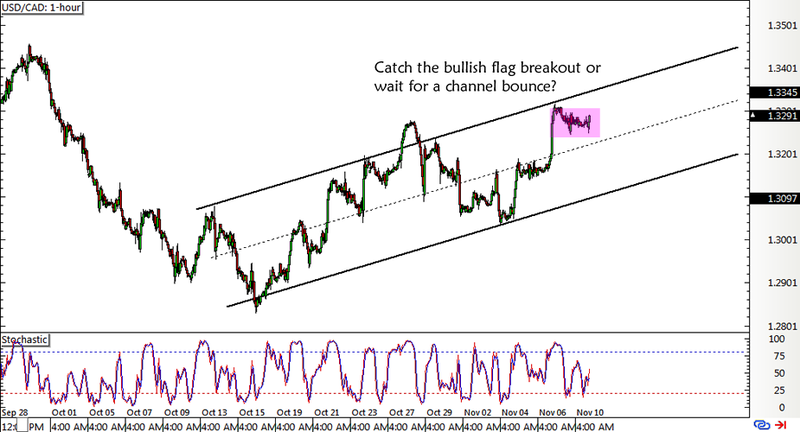 I’m also seeing a rising channel forming on the same time frame, which means that USD/CAD might still have a shot at pulling back to the channel support around the 1.3150-1.3200 levels for a better entry area. This could potentially give me a much nicer return-on-risk if I’m able to go long at that forex support zone. For my profit target, I’ve got my sights set on the yearly highs close to the 1.3500 major psychological level but I don’t mind aiming higher if U.S. data gives the pair another big boost. I’ll set my stop just below the channel support at 1.3150. I’ve already entered a small position at the 1.3300 level since price already seems to be making an upside breakout from the consolidation pattern, and I’m setting another long order at the 1.3200 mark. If you’re thinking of joining me, don’t forget to check out our risk disclosure! Long USD/CAD at 1.3300 (0.25% risk) and 1.3200 (0.25% risk), stop loss at 1.3150, initial PT at 1.3500. I’ll either trail my stop or lock in some gains at the yearly highs, depending on how economic data turns out this week. What do you guys think of this forex setup?